Of all the emotions we face as humans, fear and love are by far the most powerful. I don’t claim to be an expert on love, but I wanted to write a blog about the fear I see consume people every day. We have all felt it. The unsettling feeling before we stand up before a group of people to give a presentation, when we are judged by a manager, when we have to make decisions that we know others won’t be happy with. There is no getting around the human condition of fear. The question is whether or not this fear controls us. Fear can cause us to stop in our tracks, which is probably something we as humans learned to do as we evolved from being hunted by scary predators in the wild. It is a natural reaction to do this, but when we let fear control us, we let other forces keep us from doing what we want. If fear won every time, we wouldn't have astronauts, deep sea divers, pilots, base jumpers, or any number of amazing humans with their incredible accomplishments. When it comes to building a better way for your organization to manage sales and marketing, the same kind of fear can rear its ugly head. It's up to you to recognize that fear, respect it, and overcome it. I have talked with clients who have hesitated to pull the trigger to implement a Customer Relationship Management (CRM) system for their business because they’re afraid of what it may do to their livelihood. What if no one likes it? What if we choose the wrong software? What if my employees hate me for making them use a CRM? Sometimes, it’s impossible to avoid personal feelings when it comes to business decisions we make. So months will be spent investigating, looking at product reviews, getting demos, talking to friends, and seeking approval from managers and colleagues. But here’s a secret. 90% of the challenge of implementing a CRM isn’t about the software. Buying Michael Jordan’s shoes doesn’t make you able to close your eyes and hit a 3-pointer at the buzzer. Practice does. You earn that confidence through hours of sharpening your skills. Michael Jordan could hit 3-pointers in any shoes. So what does basketball have to do with CRM? Your CRM is that pair of sneakers. For the game you need good sneakers. Those sneakers need to support your ankle, they have to be lightweight, and they should look good for the fans. There are a lot of sneakers you could wear, and there are a lot of CRMs out there. Most should be able to do what you want to do. CRM is a mature industry. Whether you choose Salesforce, Sugar, Oracle, our friends at Mothernode, or GreenRope, you will have software with the power to accomplish your goals. So if it isn’t about the shoes (or in our case, the CRM), what is it? Why am I, the CEO of a CRM software company, saying it isn’t about the CRM? The greatest predictor of success for the implementation of a CRM is about the people that configure and use it. Every project in a company needs a champion, and likely that person is you if you are reading this. If you are afraid to choose a CRM, sitting back and waiting for the magic answer to drop out of the sky, your fear is preventing you from growing your business. In a competitive market, where CRM is highly correlated to company growth, waiting to implement a CRM is slowly digging your company’s grave. That doesn’t mean you should pick the first CRM you find on a Google search. Before you even start to look at a CRM, you must lead your company to a unified vision of the overall goals for your CRM implementation. This means bringing everyone together, often a daunting prospect. Everyone will have input, and what happens if you don’t take that input and include it in the final product? What if too many cooks make it impossible to design what the CRM should do? These questions can send you down a spiral of uncertainty and doubt. It takes a strong leader to step in, accept input, and put together the best plan for the CRM. You can’t please everyone, but if you are given the authority (or take it), you can determine the requirements for the CRM and how it should be used. You may not be a CRM expert. You may not have any experience designing one for a business. Communicate that to your CRM vendor. If you need help with designing the data structure of your CRM, connecting it to various parts of your business, or building creative content, tell the vendor. The vendor may be able to help you with all of that, or they may recommend a systems integrator. Be clear with what you want the vendor to do for you. At GreenRope, we offer 3 hours of account setup training with every new account. For some that is plenty, for others more training is required. Some clients come to us and need websites and emails built for them. Some want us to design workflows for them. In all cases, the more you know about your business and process ahead of time, the easier the CRM implementation will be. Early on, inform the vendor of your requirements so they can allocate resources to help you. Be up front about what you know and what you don’t know. Do not fear judgment from your CRM vendor – we all deal with companies, large and small, in every industry. We know what it’s like to help all different kinds of clients, with all ranges of experience and expertise. Ultimately, we would rather you do it right the first time and see you succeed than be frustrated with the CRM and not implement it. Leadership does not mean the absence of fear. It means understanding it and accepting that you will make mistakes and suffer the consequences of those mistakes. Weak leadership will stall your CRM implementation, and it will have nothing to do with the software you choose. A study done a couple years ago placed the CRM implementation failure rate at 60%, based on surveys they gave to users of those CRMs. Is that failure from software? When they investigated why, they saw the problem had nothing to do with the CRM. Failure was most strongly correlated to inadequate resources and lack of direction from leadership. 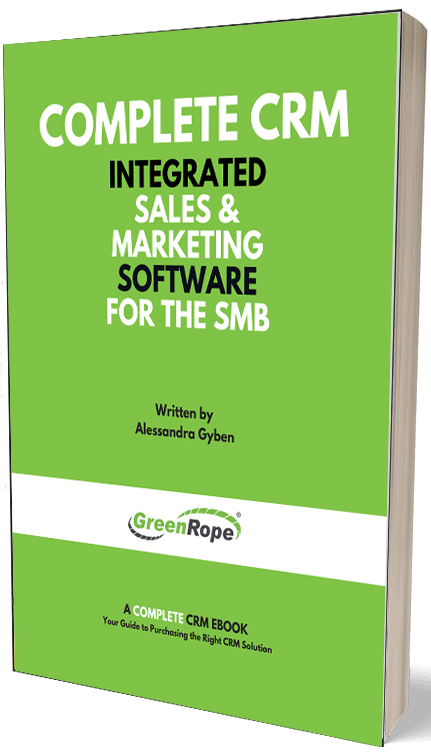 If you are involved in making the decision to implement a CRM for your organization, remember that picking the right software is just one part of your journey. You want to wear good shoes, but the ability to hit that 3-pointer is much bigger than the shoes. Do your due diligence. Find out if the CRM can do what you need it to do. But once you pick it, commit to it. Show up to your training sessions. Read whitepapers. Get your team involved. Use it every day. The moment you stop using your CRM, or pass the mantle of implementation to someone not invested, is the moment you doom your CRM to failure. A CRM is only as good as the people using it. Show your organization that the CRM is not to be feared – it is not a hammer to punish low performers (a fear-based observation). The CRM is designed to help people do what they do better. The CRM is here to arm your organization with more information, to make your business more competitive in a competitive marketplace.